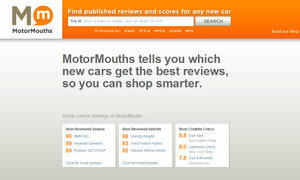 MotorMouths gives one click access to critics’ scores and reviews of any new car. The site was built with simplicity in mind that cuts through all the chaos and noise of existing car sites by giving users a quick read on the critical consensus for any new car. Here’s how it works: MotorMouths gathers and organizes the latest car reviews from leading publications. The service then derives a vehicle score for every new car, based on what each critic wrote about it. Then a calculation of the average of those individual scores is made to determine an overall score for every car, which in turn allows different cars to be ranked alongside each other, by make, style, price, and so on. One other thing MotorMouths did, was build a credibility system, so that car owners could rate how accurate a review of their car turned out to be; that allows the system to weed out critics or publications who fall below a certain credibility threshold. A really cool feature was rolled out yesterday, it’s MotorMouths’ Twitterbot. What it does is allow Twitterers to get scores and reviews of any new car via Tweets (@motormouths).